Every single time you do a drift in Mario Kart, you charge up a speed boost that unleashes when you exit the drift. But there’s a lot more happening under the hood when it comes to this speed boost: how fast it charges, how long it lasts, and whether or not it’s actually going to shave any seconds off your final time. That all depends on what kart you choose and which track you’re on. 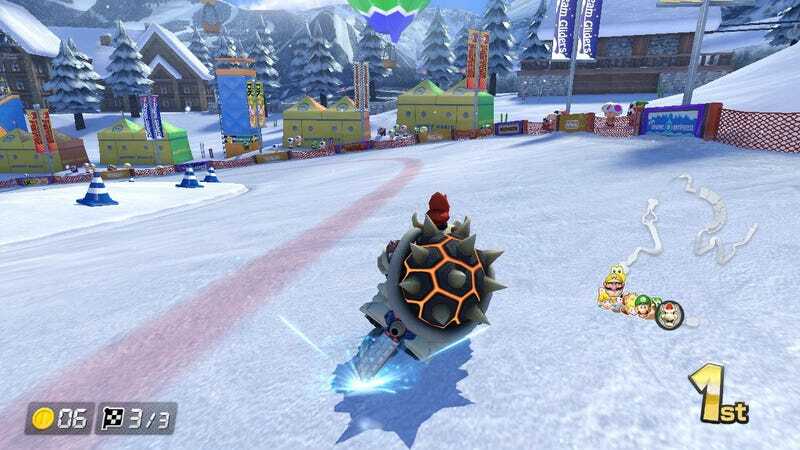 This speed boost is called the “mini-turbo,” and as of Mario Kart 8 Deluxe, it can be charged up to a super mini-turbo and even an ultra mini-turbo. The longer you drift, the more the mini-turbo charges up, lengthening the speed boost you get after your drift. The mini-turbo charges up faster for some karts than others. There’s a hidden stat for this that you can only find in the Mario Kart 8D strategy guide. But how much does the mini-turbo boost actually change your speed? Turns out it’s almost impossible to find out. Every Mario Kart game used to have a speedometer, which players could set to miles or kilometers. Starting with Mario Kart Wii, the speedometer disappeared. So, no one has any idea how fast they are going in modern Mario Kart games. What’s more, now no one has any idea how long any of the tracks in Mario Kart are. The only way to measure each track is by the length of time it takes to complete. That length of time varies according to the most recent record set by Mario Kart 8 Deluxe racers, as catalogued by the MK8DX Records YouTube channel. Without access to data on speed or distance, the only way to figure out how fast a kart is going is to record video of the game and count the frames. A Mario Kart aficionado who goes by Luigi_Fan2 did just that and created several spreadsheets, including rough estimates of how long it takes to charge a mini-turbo, as well as how long the speed boost lasts for each kart. The mini-turbo stat starts at 1 and goes up to 5.75. The higher the mini-turbo stat, the faster the boost charges during a drift, and the longer it lasts after the drift is done. Luigi_Fan2 estimates that a kart with the highest possible mini-turbo stat gets a boost that can last from 48 to 188 frames, depending on how long it has charged. A kart with the lowest possible mini-turbo stat would have a speed boost that only lasts for 28-133 frames. The game runs at 60 frames per second, so if these estimates are accurate, this brief speed surge can last about 1-3 seconds for a kart with the highest possible mini-turbo stat, or .5 to 2 seconds for a kart with the lowest stat. Those extra seconds seem like they’d make a big difference, especially for Mario Kart world record holders determined to shave tenths of a second off their time. They must be choosing karts with a high mini-turbo stat and charging their boosts up to full power on almost every turn, right? Not necessarily. On many courses, it doesn’t benefit drivers to choose a kart with the mini-turbo boost in mind. Take, for example, the most recent world record placed in Mario Kart Stadium on 150cc by a player who goes by HD. HD’s build has a moderate mini-turbo stat of 3.5, and on this course, the mini-turbo boost almost never gets charged up to its full purple spark powers. This track offers only one drift curve that’s long enough to charge the full boost. The rest of HD’s boosts in the race don’t get fully charged. It’s easy to charge up the mini-turbo to its highest power on the tight U-bends, and Mario Kart Stadium only has two of these. For this world record holder, there’s really only one U-turn, because HD takes a shortcut over the first one. As a result, the mini-turbo only charges up to ultra speed on the second and final U-turn of the course. Mario Kart Stadium has a lot of long straightaways and softer turns. HD’s build has a relatively low mini-turbo stat, but it’s got very high speed stats. For a course like this, with so few U-turns available to charge up the mini-turbo boost, raw speed is what counts most. By contrast, here’s the world record holder for Super Bell Subway on 150cc, a course with several U-turns and lots of opportunities to fully charge up the mini-turbo. This racer, who goes by K4I, took the record on a build with a 4.75 mini-turbo stat and lower speed stats than the build that HD used on the Mario Kart Stadium run. K4I doesn’t have to worry about speed stats as much, because the U-turns in Super Bell Subway allow the kart to charge up the mini-turbo boost on almost every single turn. Much of this course is surrounded by walls and guard rails, so K4I doesn’t have the opportunity to take shortcuts. Because every single curve has to be ridden out in full, that allows each drift boost to charge up. Having a high mini-turbo stat probably does shave seconds off of K4I’s final time. K41’s kart build couldn’t have gotten the world record in Mario Kart Stadium, though. The ground speed is too low, and there aren’t enough places to charge up and take advantage of the mini-turbo. Meanwhile, HD’s kart wouldn’t be as effective on Super Bell Subway, because the slower mini-turbo charge would mean shorter boosts and a shorter overall time. The search for the best kart in Mario Kart 8 Deluxe still has more than one right answer, depending on the track. There may not be precise measurements of how much of a difference the mini-turbo makes, since distance and speed can’t be measured in the game. Still, on courses with lots of U-turns, it can’t hurt to use a kart that allows you to level up your drifting game. That extra second of boost could make all the difference.